Breaking down the impact of the challenging harvest of 2018 on prairie producers. 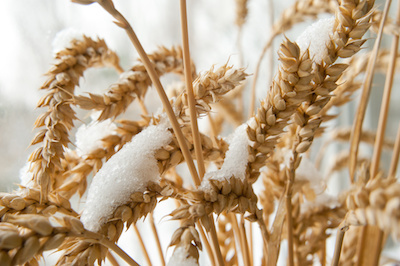 Wheat ears covered with snow. For many growers in Western Canada last year, cold, wet fall weather and some early snowfalls led to a challenging harvest in 2018. While thousands of acres were left unharvested, the number was less than what was experienced in the difficult harvest season of 2016, according to crop insurance agencies in Alberta, Saskatchewan and Manitoba. Zsuzsanna Sangster, insurance product coordinator for Alberta’s Agriculture Financial Services Corporation (AFSC), says about 260 claims for unharvested acres were submitted to her agency in 2018. That’s up from the 189 claims for unharvested acres processed by the AFSC in 2017, but it’s a far cry from the 2,255 claims recorded in 2016. Sangster recounts a lot of Alberta farmland was snowed under in 2016, which led to the unusually high number of unharvested acres that year. So when cold temperatures, rain and snow settled in during harvest time in much of the province in 2018, there were fears it could happen again. Fortunately, that wasn’t the case and warmer weather in late October enabled most farmers to complete their harvest. Shawn Jaques, CEO of the Saskatchewan Crop Insurance Corporation (SCIC), says it was a similar situation last year in northern Saskatchewan, which experienced a later than normal harvest due to snow in September that persisted into October. “Southern Saskatchewan had a really good harvest. There was warm, dry weather and they got the crop off no issue, but harvest was delayed in the northern grain belt,” he says. “Having said that, we had some warm and sunny weather in mid to late October and producers got back out in the field and finished combining. In Manitoba, about 100,000 acres of farmland were left unharvested in 2018, according to David Van Deynze, vice president for the Manitoba Agricultural Services Corporation (MASC). However, Van Deynze notes that’s only a small fraction of the overall number of seeded acres in Manitoba, which totals around nine million acres. “Most years there’s always a few acres that go unharvested, and 100,000 acres is not uncommon,” he says. Van Deynze says growers with unharvested acres are sometimes faced with a difficult decision in the spring on whether to try to market the crop, bale it for feed, or destroy the crop entirely. “If they decide to bale or destroy it in the spring because it’s deteriorated to a point where they’re not going to bother harvesting it, they should call us before they bale or destroy anything so that we can properly evaluate [the situation] and inform them how that impacts their insurance,” he says. Van Deynze says the challenging harvest in 2018 did lead to quality issues for some producers, but he adds average yields in Manitoba ended up being quite good, which dampened the number of claims submitted through the MASC’s yield-based insurance program. Van Deynze acknowledged that many producers had to incur extra costs as a result of wet harvest conditions. Sangster says some Alberta growers saw lower grain yields in 2018 because of adverse weather conditions, especially in the southern part of the province due to drought conditions in the summer. She says about 4,500 AFSC clients submitted post-harvest production insurance claims. Sangster notes that the biggest impact of the 2018 weather was on crop quality. “Grain quality was affected this year, so producers may not be able to get top prices when marketing their grain due to grade,” she says. Jaques says some Saskatchewan growers also experienced quality losses, especially with grain crops harvested later in the fall. The extremely dry summer in some of parts of Saskatchewan also contributed to significant yield losses for some growers, he says. When the harvest of 2018 started, stalled, stopped, and started up again, it was difficult to imagine how it would end. The unpredictable weather that brought early snow also gifted two weeks of warm weather allowing producers to wrap up harvest and avoid a repeat of 2016. Shawn Jaques, CEO of the Saskatchewan Crop Insurance Corporation, says any time a farmer is unsure about what kind of impact weather will have on their crop insurance, the answer can usually be found a phone call away. “If you’re experiencing a weather challenge on your farm and you think it’s going to impact the production of your crop, contact your local crop insurance office and we can help you out,” he says.